We were pleased with the results of Timothy’s Auditory Brainstem Response (ABR) procedure on Monday. Again, the results said that his hearing is pretty good and might be normal. It seems like he is hearing better, but that’s probably just us being more aware of it. Next week we visit his ENT doctor and they’ll try to remove the stuff blocking his ear tubes and hopefully re-test his ears. Timothy is still a little under the weather, and has been coughing a bunch, and sporting a little red nose and eyes.Regardless of whether he’s sick, Timothy has turned into a full fledged hair puller. Some babies gently stroke your hair. Not Timothy. He looks you sweetly in the eye, and then, without changing his cherubic expression, grabs your hair like a dandelion and pulls. This boy knows enough to grab at the roots, and can even get a good purchase on my short hair.Timothy much prefers spending time on his stomach. When he wakes up in the morning, he is often lying on his stomach. If you set him on his back he’ll be on his stomach before you can stand up. He’s especially enjoying his little ‘penguin’ move, balancing on his stomach with his arms and legs up in the air.Timothy had his first lunch of solid food yesterday. He ordered an appetizer of oatmeal, followed by an oatmeal entrée and then oatmeal for dessert. This kid must have been practicing eating on the side, because Laura gave him his first little spoonful, and he swallowed it right up and returned his mouth to the ready position for his next bite. Laura began to give him the next spoonful while Catherine and I started backseat driving, wondering aloud where the first clump of oatmeal went, and asking if maybe we should wash it down with some formula. I view us like the safety people at the top of a waterslide, and I wanted to make sure that the first rider had made it through before sending the next one. But he ate all of his oatmeal, and his first experience with solids went very well.People are nice to comment that Timothy has some cute photos, but it takes a lot of pictures to get one that actually looks like him. Here’s how a typical picture taking sequence goes — You look at him and he looks adorable; you run and grab the camera; still adorable; you take a picture, look at the camera and wonder why you now have a photo of a crabby old man. TRBL doesn’t sport a cheesy smile – it just doesn’t look like him. So it takes about 45 pictures to get 4 good ones. Thank goodness for digital cameras. I can’t wait to see this kid’s driver’s license photo. I’ve seen and heard many new perspectives during our time with Timothy, but one that caught me off guard was from a friend who has a son with a serious cognitive (mental) disability. That took me back a little. Now, I don’t think Timothy is exactly ringing the church bells in celebration over having Down syndrome, but I also don’t know how he feels or will feel about it in the future. My starting assumption is that it’s a tough deal and that I should feel sorry for him. But maybe the point is that I should suspend my assumptions and just meet him where he is – as a beautiful little boy – and try not to let the Down syndrome thing cloud my view too much. I will say that Timothy is a happy little boy — especially when he’s pulling your hair. 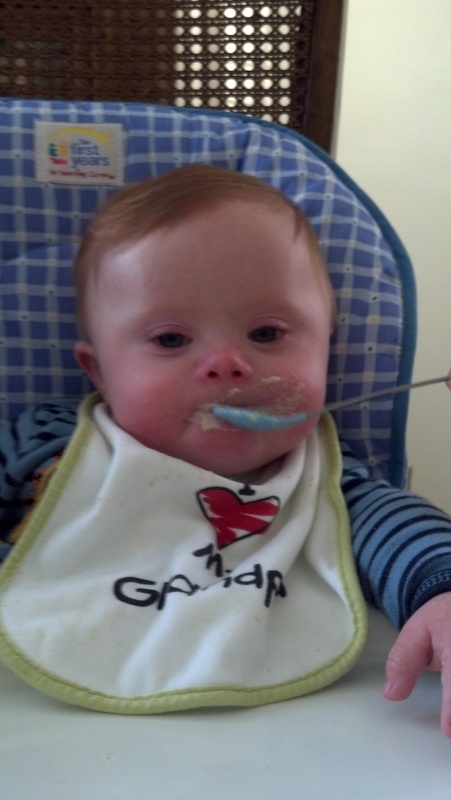 This entry was posted in Doctor, Down syndrome, Eating, grabbing, happy ears, Parenting lessons -- Don't try this at home and tagged ABR test, Driver's license photo, Lying on stomach, Oatmeal, Solid foods. Bookmark the permalink.